Every one of us know the impact of Global warming, how it effects the environment weird now and more than this the future. What we are going to do for the feature generation and how to route them up from these defects. 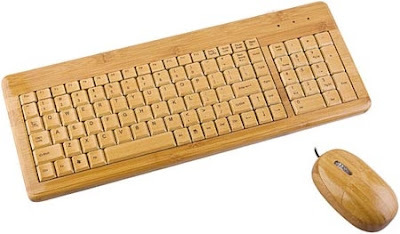 And while the gadgets which are made from artificial elements are at top swing, here is one among them, Bamboo Mouse and Keyboard made up of Bamboo a natural element, eco-friendly. Of course though this type of devices is worked out at times but how come these are going to compete with the existing ones which is harder to replace with performance expected more than others. Though it is unavoidable to compare with Hi-tech combo but however let you to feel the difference while handling. Keyboard - $39 / Mouse - $19 / Keyboard + Mouse - $52. It is actually one of the steps going close Eco-friendly with this Bamboo mouse and Keyboard by the manufacturer.